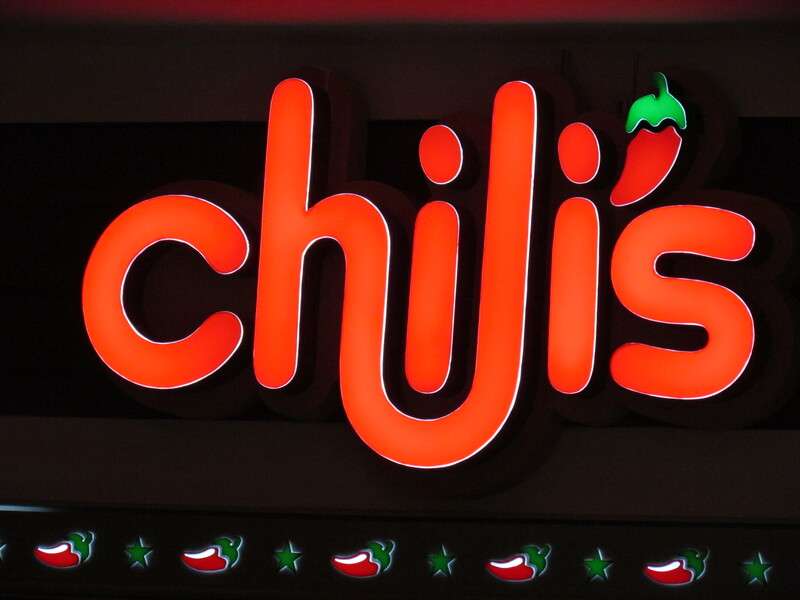 A very interesting place to have some good Tex Mex food in delhi / Gurgaon in an ambience that is no different from the ones in the North of America. 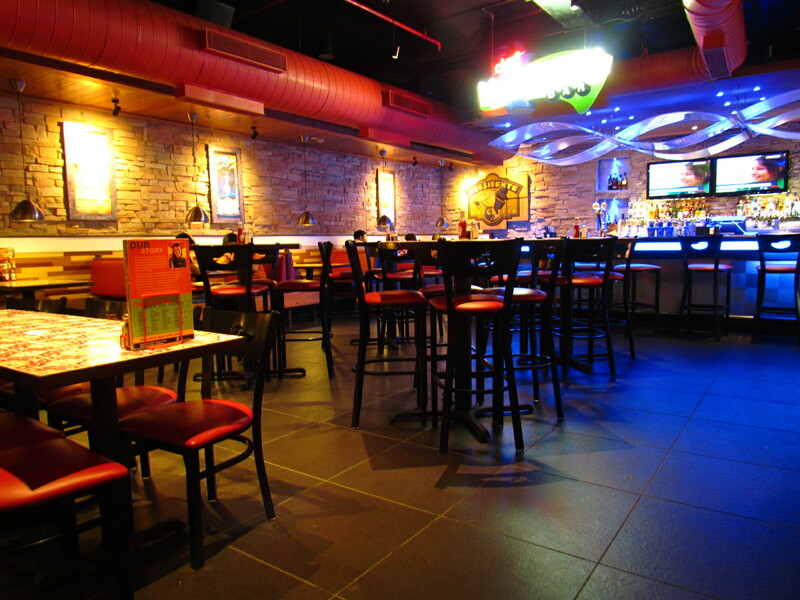 The look & feel of the interiors of the restaurant is same as u wud come across in North America. The wooden sofa / chair seating, the beautiful red & white designed tabletops, the numerous funny & not so funny but smart posters on the wall & so on. For 4 – 6 diners there were sofas & there were plenty of table-chairs for couples. Loved the concept. 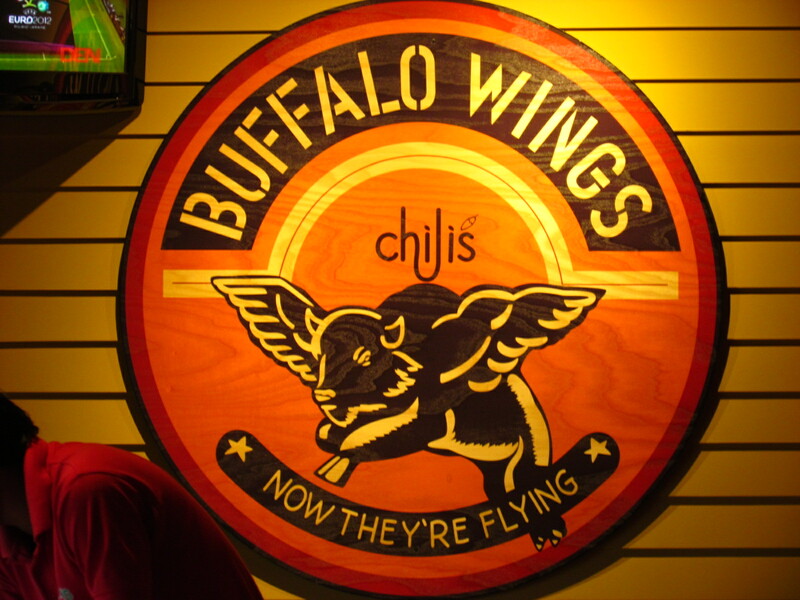 One of the posters said ‘I want my baby back ribs’ but sadly those were not being served. I loved the buffalo wings wall post. However, unlike the Delhi & Gurgaon ones, most of the American ones are not in Malls but are standalone. The guys on service are very good, polite, warm & quite friendly as well. The menu card was colorful & was full of excellent photographs of food. 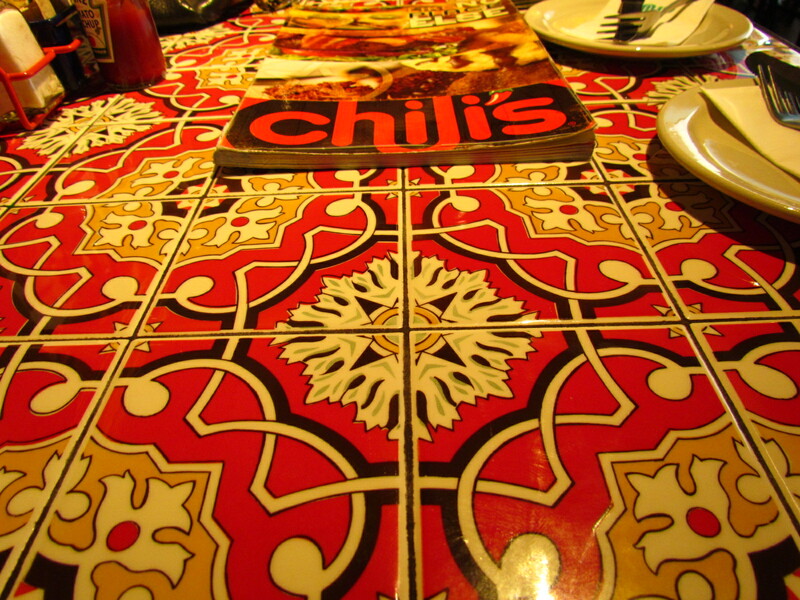 We decided to stick to ‘Mex’ (Mexican) & our friend & Guest Blogger Neha decided to try ‘Tex’ (Food from Texas, USA) as well. We liked the food & wud surely get back. Not at par with the stand-alone Tex Mex restaurants in Southern part of USA but quite good on its own – given that its a restaurant chain. Good alternate to TGIF which is quite good itself. 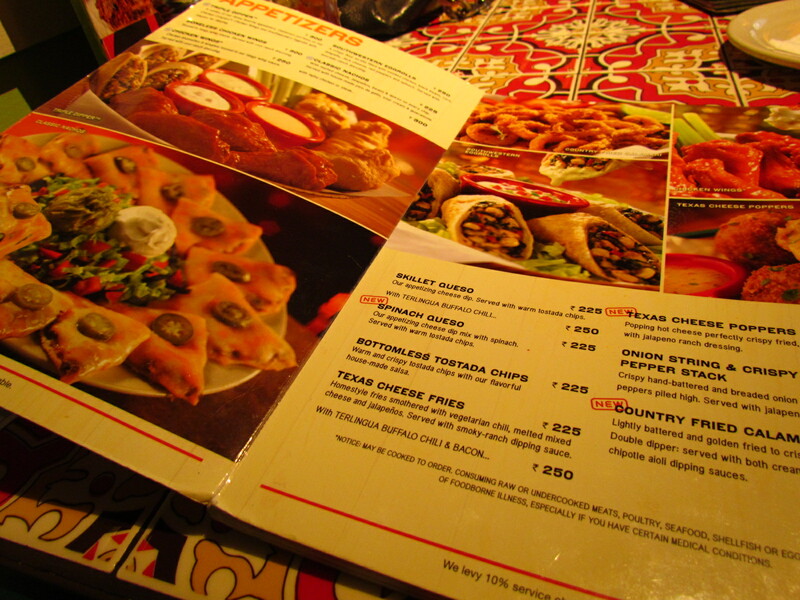 Pricing here is quite interesting – Food is quite cheap but drinks are just the opposite. e.g. 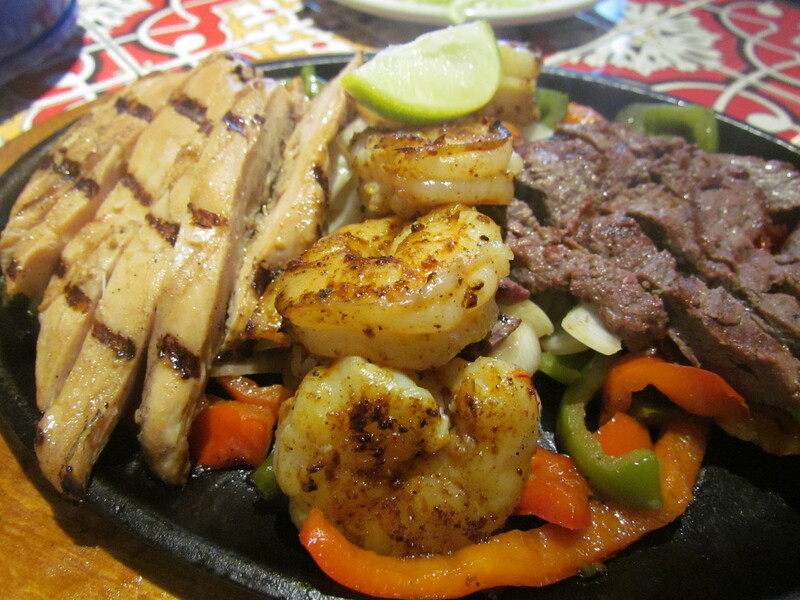 A trio fajita (read details below)that can fill up 2 people for an evening snack is for Rs. 400 whereas a margarita is for Rs. 350. So u pay Rs. 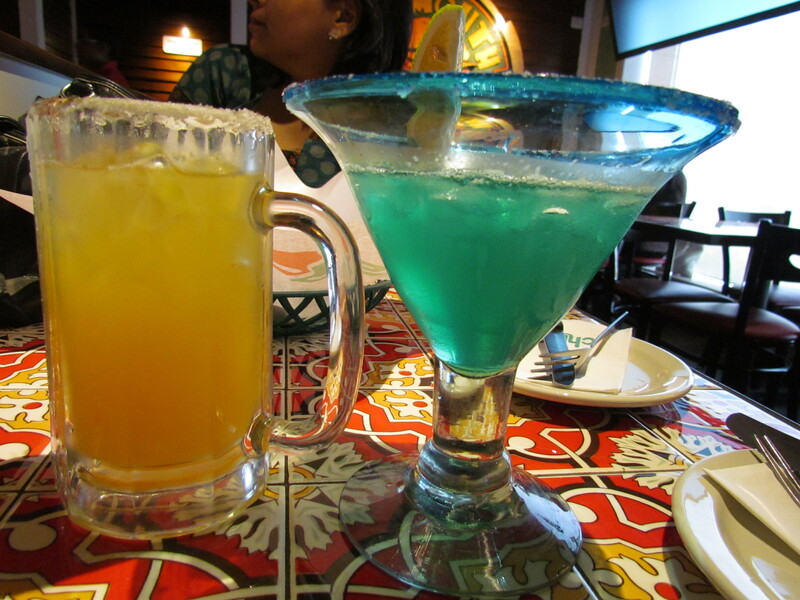 700 for 2 drinks & only Rs. 400 for a meal that totally fills u up!!!! 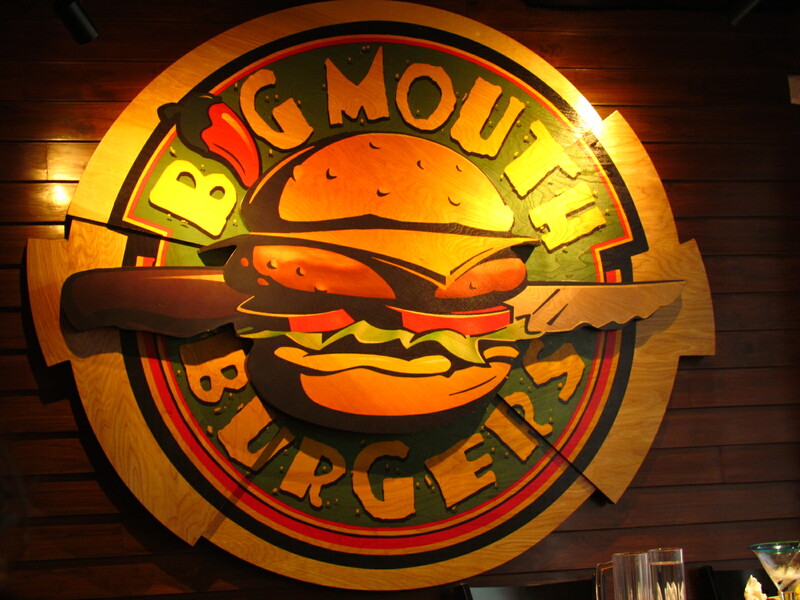 Big mouth burgers were superb…cheesy with crunchy crispy beef burger patty in between. 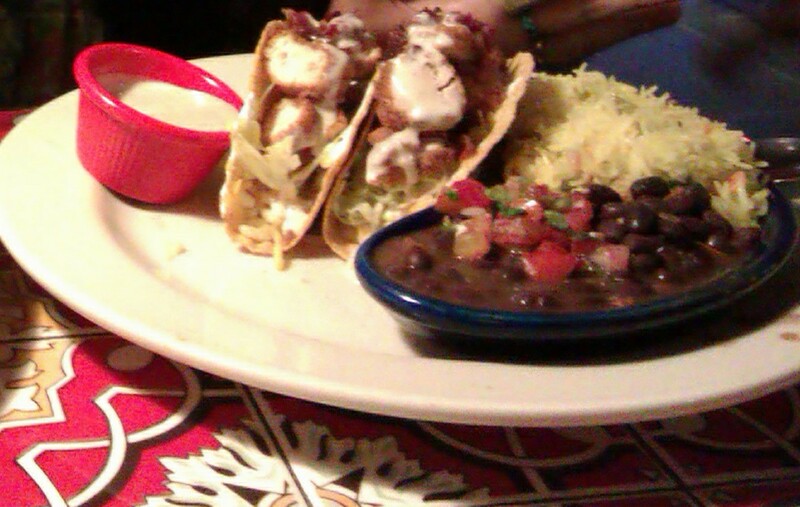 Crispy Chicken Tacos were wow!! the chicken was really crispy, with tiny bits of crispy proscuitto and bacon and lots of jalapeno dip. The rice and black beans accompanying the tacos were delicious too. 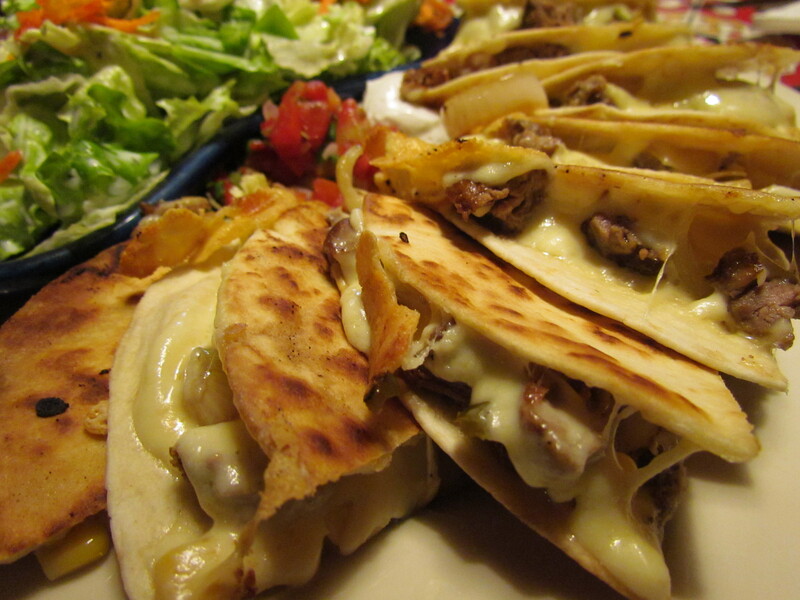 We asked for a Kicked up Quesadilla – It was fajita, marinated steak with grilled onions, tangy jalapenos, sweet corn, green pepper & jack cheese in toasted tortillas. Too cheesy for me but the taste was quite good. The outer layer was perfectly crisp & tasted wow. We also tried loaded nachos with steak. 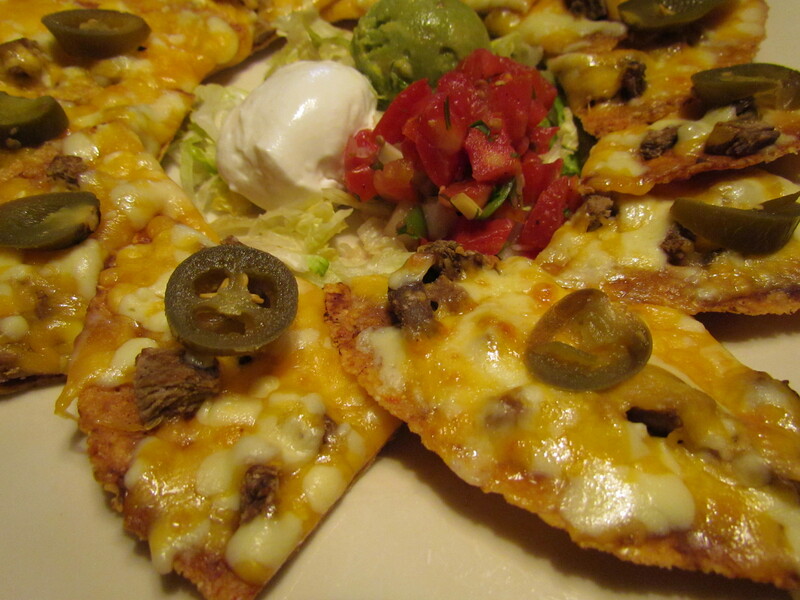 Excellent crispy nachos with a cheese top, steak. This was served with avocado, sour cream & a nice pico di gallo. Loved it as well. 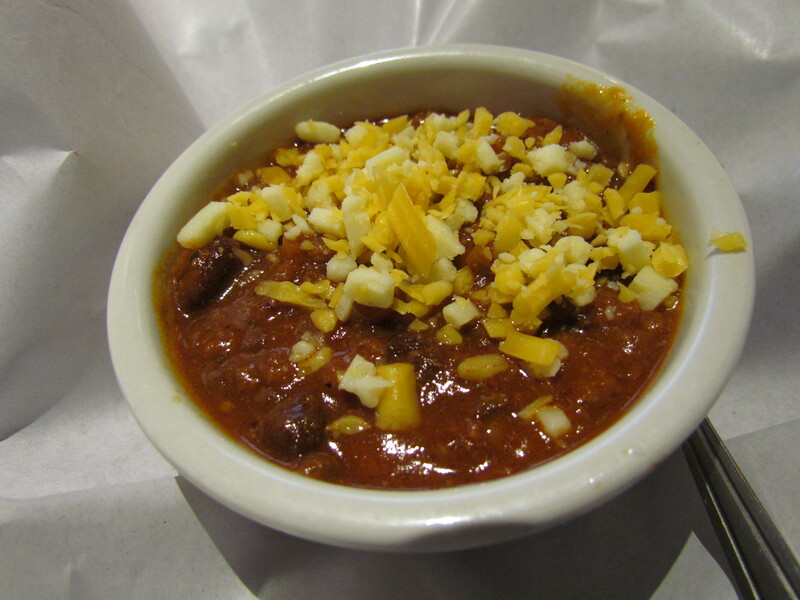 We started with Buffalo Chili soup. An outstanding thick soup with minced buffalo meat & kidney beans cooked over a long time. It was garnished with shredded eggs & cheese. Excellent. We went for fajitas. For the uninitiated, fajitas are kind of maida rotis. They r served with grilled veggies / meat. 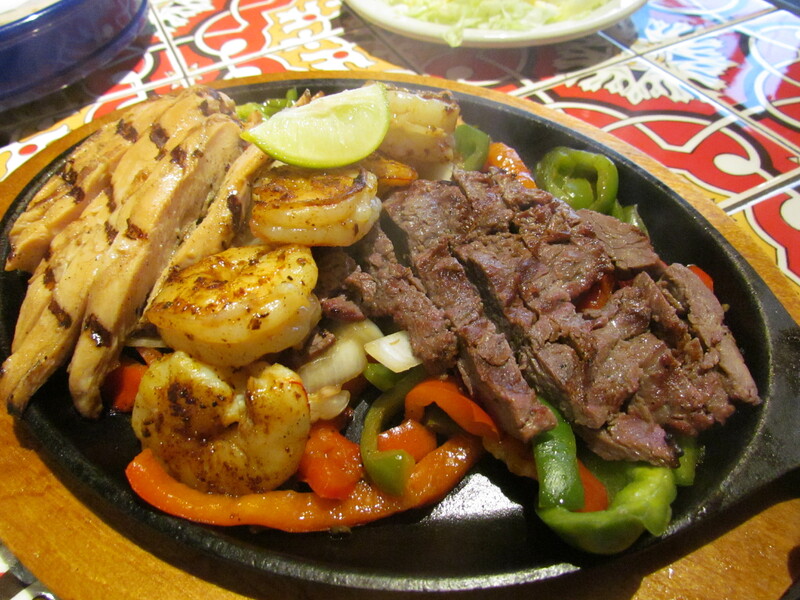 The grilled food is put in between the fajita & eaten .Interestingly, in the menucard, there was a pictorial description of how to fold a fajita. Good. 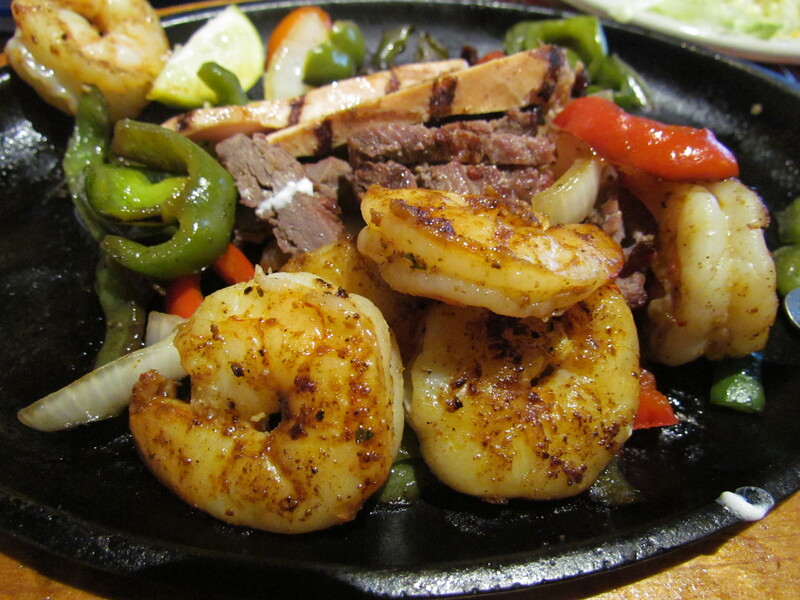 We ordered a grilled trio – grilled tenderloin, grilled prawns & grilled chicken. This came steaming hot on a sizzler plate. I had a real challenging time in taking the snaps due to the fumes. Along with the grilled meats we were served white ‘sour cream’, in-house made tomato salsa also called pico de gallo, shredded boiled eggs , Guacamole (made from avocados) , grilled thick slices of onions & grilled bell peppers. 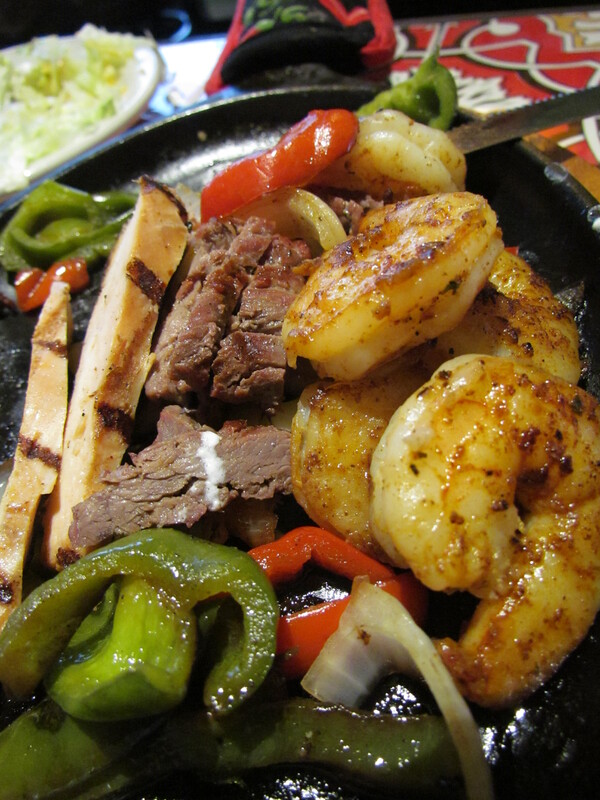 We tried everything as it is, along with the fajitas, in different permutations & combinations & quite liked most of them. 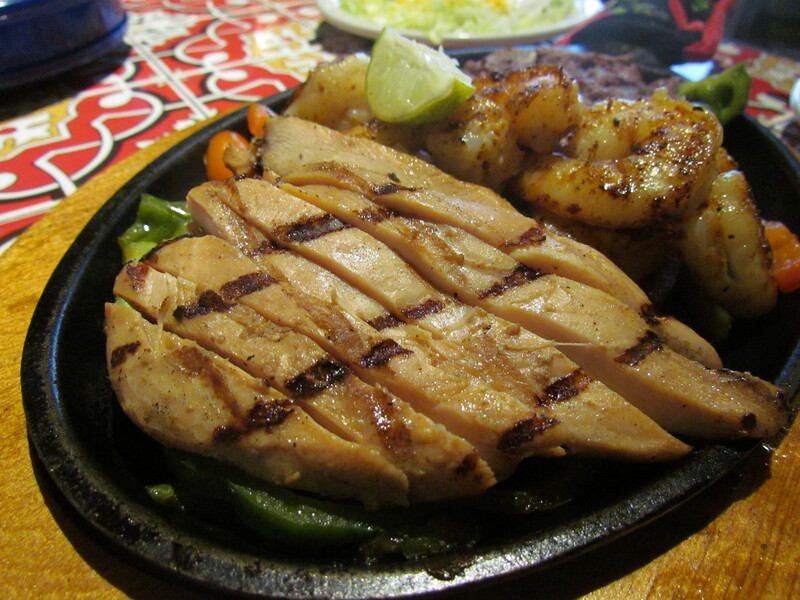 The grilled tenderloin was tasty, mildly juicy but chewy – as is expected. Grilled prawns were marvellous – they were soft, had a mild charred effect, were perfectly grilled, tasted fabulous & juicy within. The bad thing about the prawns was that the guy in charge of cleaning prawns forgot to de-vein some of those. Worst – his manager did not do random quality check as well. I ate two such prawns without noticing (with a disasterous consequence once I bit it) & when it happened the third time, I pointed it out to the waiting staff. They quickly took it back & got us 2 fresh grilled prawns. While redressal was done very amiably, I wud expect that this be taken more seriously as improper de-veining can have negative health implications on diners. The chicken was very soft, juicy & nice. I am not much of a chicken fan but this one was good. 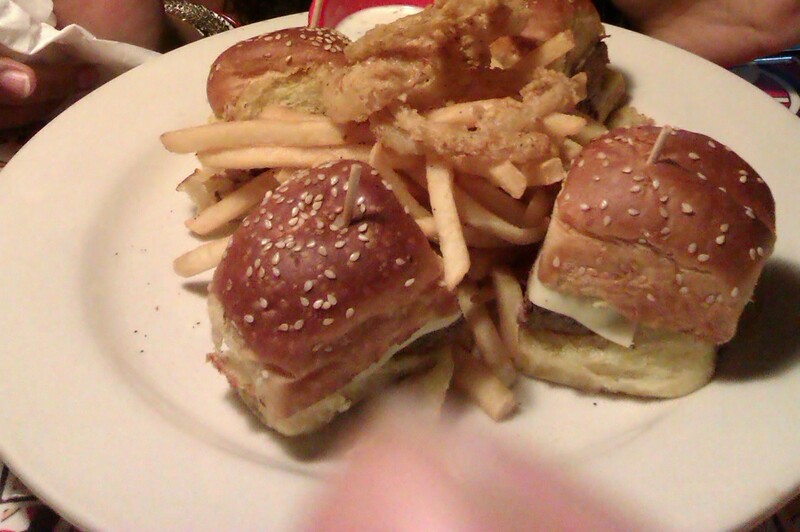 U can have any one of the above separately or a combo of all the three as we had. 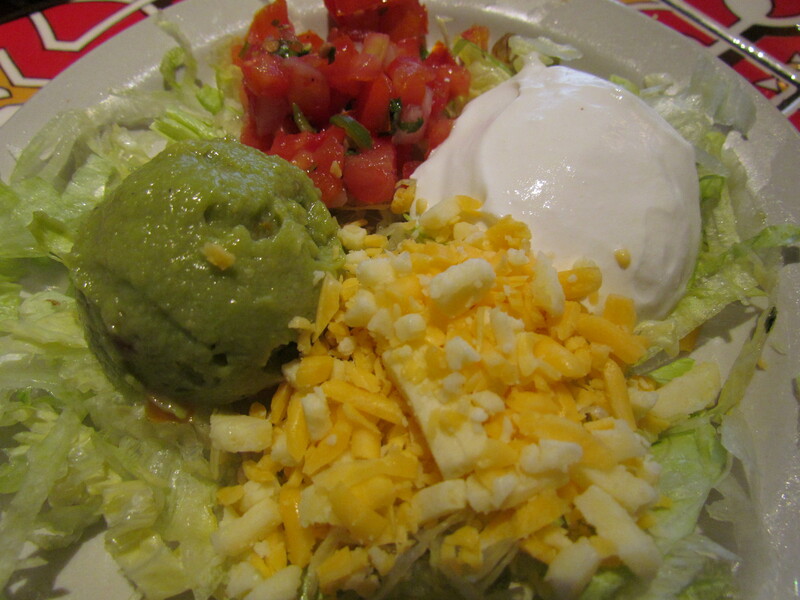 The Guacamole was very flat – almost tasteless. Sour cream was as good as it cud get. The shredded boiled eggs tasted no different than shredded boiled eggs. The salsa was good but not great. The salsa at Mi Amigos, Phoenix was phenomenally better in taste than this & so was the guacamole. 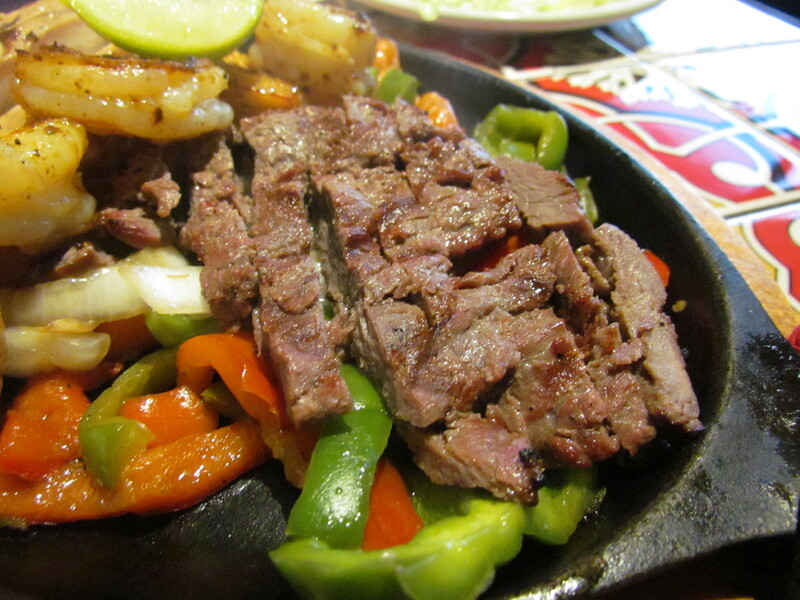 The fajitas were hot, soft & very good. Enjoyed overall inspite of the hitches mentioned above. 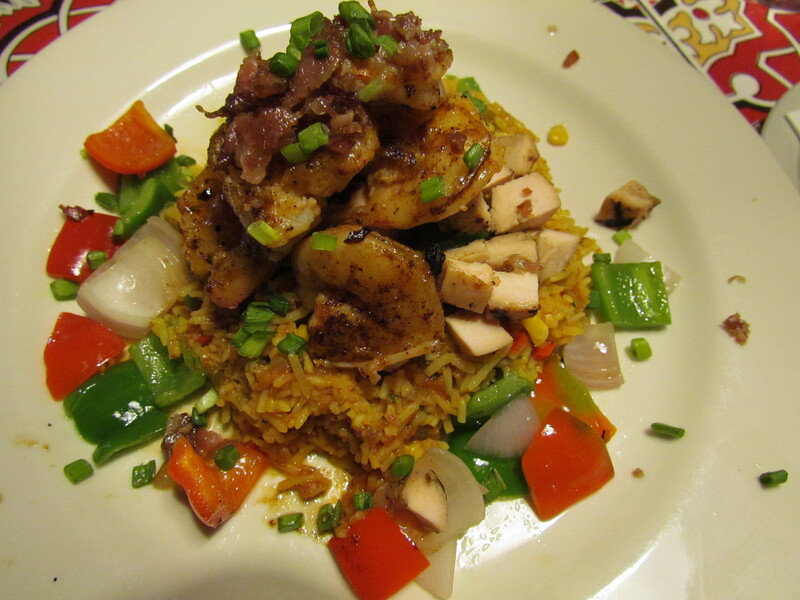 The next dish that we had was called Orlean’s Jambalaya. 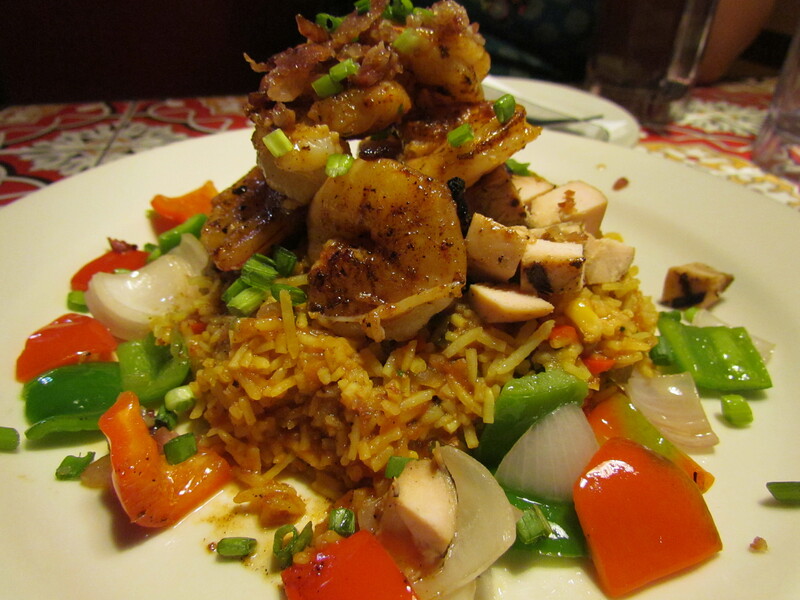 According to the menu card, this was ‘jazzy blend of diced chicken, smoky bacon & mixed veggies, all tossed in spicy Jambalaya rice & topped with plump sautéed shrimp. Sprinkled with in-house made special Cajun seasoning & sliced green onions’. 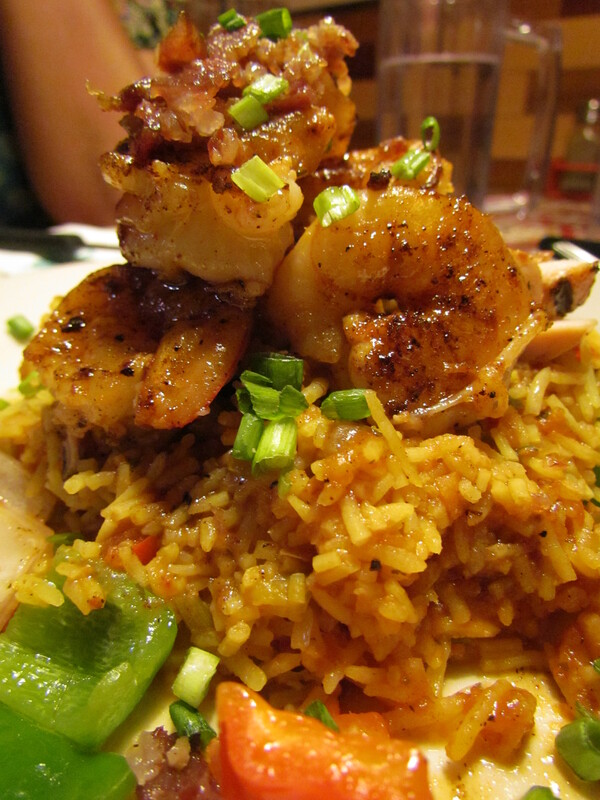 In simpler words, it was prawns, diced chicken & bacon atop a bed of Jambalaya rice. According to wiki, Jambalaya rice was an attempt by the Spanish to make paella in the New World, where saffron was not readily available due to import costs. Tomatoes became the substitute for saffron!!!! The rice was sub-optimally cooked. So, it was not melt in the mouth like our biryani rice or even the Mexican tomatilla rice that I had at Mi Amigos. Taste of the rice was good but the texture was pulling down the overall experience of the rice. 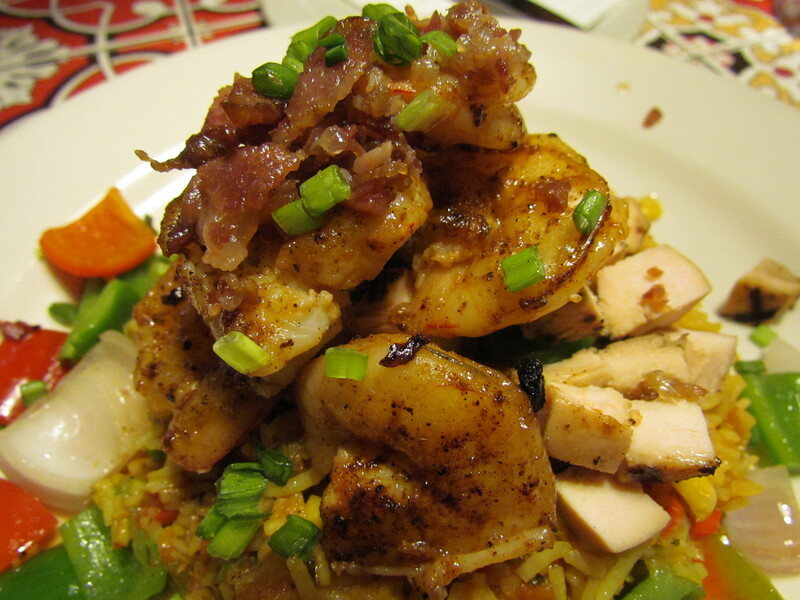 The prawns were as awesome as before, the chicken chunks were good & so was the bacon. Grilled bell peppers & white onions adorned the sides. We washed this down with some good Margarita & some OK lemonade. 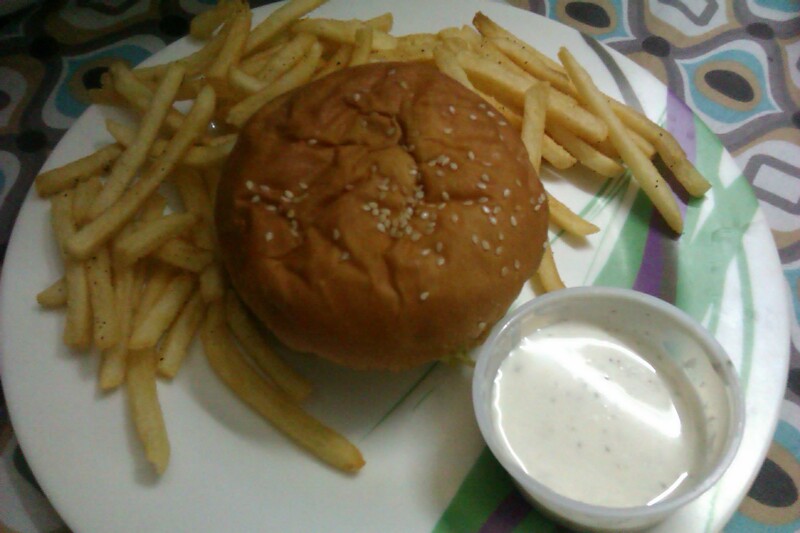 Overall – Loved the place, the ambience, the people & quite a lot of the food. I guess I wud keep going back & try the ‘Tex’ in future.